Grandma, some ninety plus years, sat feebly on the patio bench. She didn't move, just sat with her head down staring at her hands. When I sat down beside her she didn't acknowledge my presence and the longer I sat, I wondered if she was okay. Finally, not really wanting to disturb her but wanting to check on her at the same time, I asked her if she was okay. She raised her head, looked at me, and smiled. "Yes, I'm fine. Thank you for asking," she said in a clear strong voice. "I didn't mean to disturb you, Grandma, but you were just sitting here staring at your hands and I wanted to make sure you were alright," I explained to her. "Have you ever looked at your hands?" she asked. "I mean really looked at your hands?" I slowly opened my hands and stared down at them. I turned them over, palms up and then palms down. No, I guess I had never really looked at my hands as I tried to figure out the point she was making. "Stop and think for a moment about the hands you have, how they have served you well throughout your years. "These hands, though wrinkled, shriveled and weak, have been the tools I have used all my life to reach out and grab and embrace life. They braced and caught my fall when, as a toddler, I crashed upon the floor. They put food in my mouth and clothes on my back. As a child, my mother taught me to fold them in prayer. They tied my shoes and pulled on my boots. "They held my husband and wiped my tears when he went off to war. They have been dirty, scraped and raw, swollen and bent. "They were uneasy and clumsy when I tried to hold my newborn son. Decorated with my wedding band, they showed the world that I was married and loved some one special. "They wrote my letters to him and trembled and shook when I buried my parents and spouse. They have held my children and grandchildren, consoled neighbors, and shook in fists of anger when I didn't understand. They have covered my face, combed my hair, and washed and cleansed the rest of my body. "They have been sticky and wet, bent and broken, dried and raw. And to this day when not much of anything else of me works real well, these hands hold me up, lay me down, and again continue to fold in prayer. "These hands are the mark of where I've been and the ruggedness of life, but more importantly it will be these hands that God will reach out and take when he leads me home. And with my hands He will lift me to His side and there I will use these hands to touch the face of Christ." I will never look at my hands the same again. God reached out, took my grandma’s hands, and led her home. 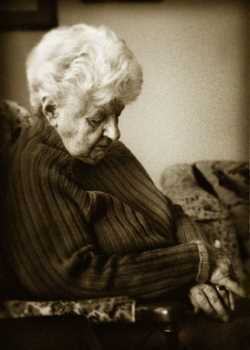 When my hands are hurt or sore or when I stroke the face of my children and husband I think of Grandma. I know the hands of God hold her, and I, too, want to touch the face of God and feel His hands upon my face. Pass this on to someone else, if you'd like. You received this from a friend. If you delete the eMail, it's okay: Nobody's luck is dependent On E-Mail.